(NaturalNews) The passing of California's SB277, a bill that eliminates a parent's choice to not vaccinate their children due to philosophical or religious beliefs, was a somber moment not only for the state of California, but for the nation as a whole, as no child should ever be involuntarily subjected to vaccines that have the potential to cause brain damage and even death. Libertarian Tim Donnelly, a former state assemblyman and governor candidate, launched a referendum to overturn California's forced vaccination law. While the filing in and of itself is a victory, there is a lot of work to be done, and a very short amount of time to do it, so we need your help. If enough signatures are collected for the SB277 Referendum, California's mandatory vaccination law will instantly be halted and placed on the November 2016 ballot, providing citizens with the opportunity to vote on the measure. If Californians vote against mandatory vaccinations, SB277 will essentially be nullified. Overturning California's forced vaccination law is incredibly important as it will not only save lives and protect public health, but it will also protect a child's right to education. 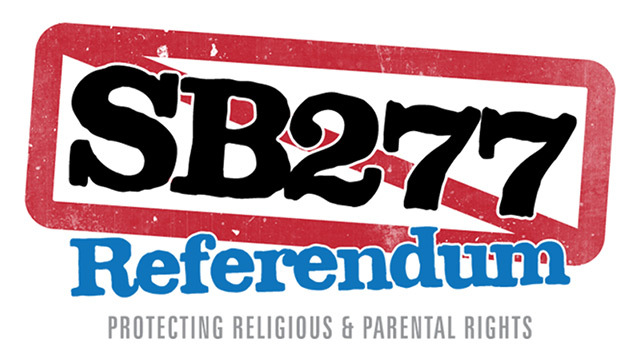 This referendum against SB277 is important to SO many parents of children who would otherwise hit the vaccine mandate at the start of the 2016 school year, because SB277 is slated to go into effect July 2016, right before the school year. The SB277 referendum will immediately put a stop to that. If we get the signatures in the next couple of months, this will go to a November 2016 vote. This means that ALL parents will be able to enroll their children in school even if they are in kindergarten or 7th grade in August/September 2016. So, pass or fail, the referendum effort WILL mean that thousands and thousands of kids will not have to be kicked out of school! The SB277 supporters know this, and they don't like it. Won't you help us keep kids in school where they belong? Donate today and sign up to volunteer. We can't do it without you! Please sign the petition to stop mandatory vaccinations in California – time is running out! If you're interested in signing the petition, or passing along the information to your friends, family, co-workers, neighbors, schoolteachers – or ANYONE else who lives in California – please check this website daily for a list of locations in which you can sign your support. In order to instantly bring SB277 to a halt, the referendum needs 365,880 signatures from California residents by September 28. Beginning when the referendum first launched on July 1, proponents were given just 90 days to both organize the campaign, as well as collect the 365,880 signatures – a massive overtaking that requires an immense amount of help. At the time of this writing, only 54 days remain in order to obtain the signatures, so please act fast and spread the word! The number of signatures collected will be kept private until after September 28. "Like" the SB277 Referendum Facebook page here and their Twitter page here. Make sure to use the hashtag #SB277Referendum to draw as much awareness as possible. Learn more about the harm caused by vaccines at stopmandatoryvaccination.com.